The optical constants of metals given in reference tables are the so-called Drude constants, which pertain to normal incidence of light. They are generally measured by katopteric methods at angles of incidence greater than zero. It has sometimes been suspected that the values so measured are not constant but vary with the angle of incidence. 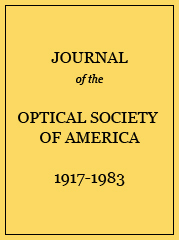 This report concerns the optical constants of gold films prepared by vacuum evaporation. The results indicate that the Drude constants do not depend upon angle of incidence, and that observed variations are due to various experimental errors. Refractive index n, absorption coefficient k, and extinction coefficient K vs angle of incidence ϕ for gold at λ=5461Å. Refractive index n absorption coefficient k, and extinction coefficient K vs angle of incidence ϕ for a slightly transparent gold film at λ = 5461 Å. Variation of refractive index n and absorption coefficient k with 0.1° changes in ϕ, Δ, and ψ. Data of Feachem and Tronstad for Hg at λ=5461 Å.
a Not given in the original. Data (Table IV) of Feachem and Tronstad recalculated from Eq. (1). Variation of n and K with ψ, ϕ, and Δ, from the data of Ref. 4.